Each school in Trabzon's Ortahisar district in northern Turkey will look after a stray dog, in a cooperative project by Trabzon's Animal Welfare Organization (TRAHAYKO), Provincial Director of National Education and the Metropolitan Municipality. Called the Ortahisar Love Vaccine, the project aims to teach children compassion for animals early on by giving them the responsibility of looking after stray dogs. According to officials, each school in the district will receive a rescued dog along with a free doghouse. Only dogs with calm behavior, assessed by veterinarians, will be assigned to schools to ensure children's safety as they feed and pet the dog. 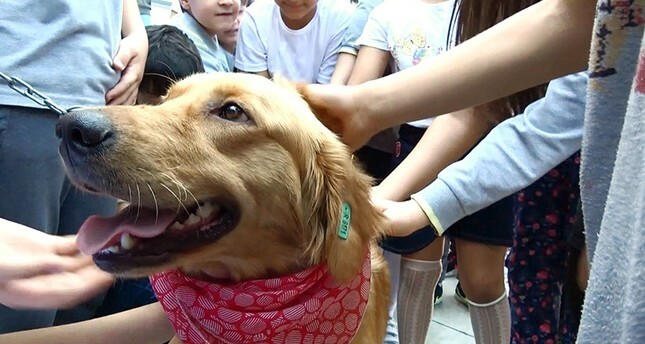 The first school which received its rescue dog, a golden retriever called "Bes," already proved the project to be popular among students, who formed long lines during their lunch break to pet and feed the dog. Referencing the recent reports of various animal cruelty cases throughout Turkey, TRAYKO head Lütfiye Tüzün Kurban says children should be taught about compassion early on. According to Kurban, a child who learns compassion by taking care of an animal will have an easier time communicating with people from different cultures.